'Ramte Ram Aao Ji Aao Ji, Udiya Ki Goniya Laoji' Shirdi Sai Baba used to sing these words in sweet and pure voice while sitting near dhuni in Dwarkamai. This post is somewhat related to this. It gives me immense pleasure to inform that Sai Udi Prasad will be sent to anywhere in the world the grace of Shirdi Sai Baba. After the seva/service of sending prayers to Shirdi, Sai Baba has given me this responsibility. Devotees can fill up the form available here (please follow the link) in order to request for Sacred Ash. This selfless service is being provided by Sai Dham Sola Temple situated in the city of Ahmedabad, Gujarat. History and Details of the templle is available here. Devotees who wish to send acknowledgements of receipt of Udi can mail to sai@saidhamsola.org. I would request devotees not to send their postal address in comments of this post. Please fill in the form with complete details so that the authorities can serve you better. Please fill the form given in the post above to receive Udi. Thank you so much for the wonderful website. I am glad to found your blog. May Baba Bless you and your family. Sai Ramji ! I tried to go to the above mentioned website to order the free Udi but for some reasons it doesnt seem to be working. By clicking the submit button it doesnt give any confirmation. Please advice as in what else I can do to get Baba's Udi. I just now checked, the link is working fine. Please try again. If it does not work after trying second time, please report me at the earliest. \\ A tip: Try to fill the form from another brower other than Internet Explorer like Firefox or Opera. Your Tip really worked. Thank you very much for everything. I am eagerly waiting for the Udi not sure if I would get it this far in US. I really like the work you are doing for the Sai Bhakts. I would like to help in some way possible with Baba's Blessings. Please dont hesitate to let me know if you need any services. Welcome :) You will receive Udi in US too. Thanks for wishes and praising comments. I will surely let you know if i need any help from you. May Babaji bless us all !!! Yes you can receive Udi in Fiji. Just fill in the form from the link provided in above post. Can you please advice how long does it take to receive the Udi. Its been 25 days and I havent received anything. Does it take this long ? I was just wondering and maybe getting impatient too ? Please advice. can u pls tell me ,how long does it actually take to receive baba's udi as it has been almost a couple of months that i had requested the udi. jai sai ram to all. As per my knowledge you are residing in USA, so it may take 25-30 days for Udi to reach. Moreover shortage in availability of Udi is also a strong factor which can cause delay. So i request you to wait for few more days. Still if you dont receive Udi please inform me. I would request you to please fill the form again. There is a possibility that your request has been missed otherwise it wont take this much time. How are you doing ? I havent receied the Sai Baba Udi so far. Please advice what needs to be done next. Do I need to fill in another form or so ? Please let me know. 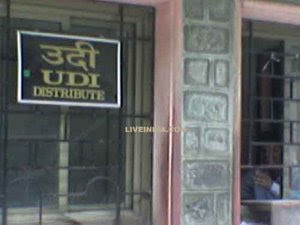 These days due to price change, some Udi packets were returned. This was informed by concerned authorities to me. However i have forwarded your request again to them and it will be taken care of soon. How are you doing ? I havent received the Sai Baba Udi so far. Please advice what needs to be done next.It has been a couple of months that i requested the Udi. Do I need to fill in another form or so ? Or will it take more time to reach canada? Please let me know. I am forwarding your request to concerned authorities, who will do the needful. If required, you will have to re-submit the form and that will be informed to you. Thanks for your patience and co-operation. IM RISHI HERE FROM MAURITIUS I HAVE GONE THROUGH UR WISH I WOULD BE BLESSED BY BABA FOR ALL MY PROBLEMS BE ERASED. IM IN NEED FOR THESE ITEMS UDI, BIBHUTI, SAISATCHARITRA, PICTURE OF SHIRDI/SATYA/PREMA SAI BABA AND SAI BHAJANS AND KIRTAN CD'S IF POSSIBLE. above is my full mailing address IF POSSIBLE YOU CAN SEND ME THESE ITEMS I SHALL BE INDEBTED TO YOU. PLZZZZ HELP ME? Please fill in the form in the post above with your complete details to receive Udi. PLEASE SEND ME BABA'S SACRED UDHI. OM SAI RAM. IWILLBE GREATFUL TO YOU IF YOU SEND ME UDHI. i had filled the application form for getting sacred udi long time back(about 6-7 months. but i hv not received anything yet.so i request you to make necessary arrangements for the delivery of udi at the earliest. I shall look into the matter and needful will be done. Sorry for inconvenience caused. om sai ram. baba aapki bahut krupa hai. dhanyavad. jay sai ram. om sai ram. baba hamesha saath rahana. dekhate rahana hum to so jate hai per aap humra dhyan rakhate ho. hum chalte hai per dhoop aap sahte ho. kya kahu baba aap bahut achhe ho.sai raham najar karna bachcho ka palan karna. Thanks for sharing this mantra. Mp3 format of the same mantra will be posted soon on another blog of Sai Baba Bhajans http://www.shirdisaibababhajan.org/. please send the udi prasad. Dr nagaraj b konanavar.pronto clinic goaves circale khanapur road belgaum. karnataka state. Can you please tell me how long it will take to get Udi in Canada? I already send request for Udi and its almost going to be 4 weeks now. Can you please advice when will i get Udi in Canada? Its more than a month since i send a request for it. First of all sorry for replying lately. Please e-mail me your postal address on admin@shirdisaibabastories.org. I will try to send you Udi as soon as possible. Thanks a ton for starting this sending udi abroad service. I relly could not have asked anyone but when I saw your website I jumped with joy. I am in Denmrk and we are covered with atleast 1.5 metre snow here. I do not have ghee tel etc too and I cant even ofer flowers to baba and I have just Baba photos with me and all I do is pray to him with lighting a smll candle everyday and I have little dhoop from India. I love you for this. Thanks again. My sai bless you. Your sister. Thanks a ton today I got Udi with a beautiful picture o Sai Baba at my Denmark address. Also I have send my acknowledgement at sai@saidhamsola.org. At first it looked like a dream coz it came early morning 8 o clock. I live in USA and I got my Udi last night with the beautiful Saibaba pic with it. Thanks so much!!! SAI Baba plz mujhe udi bhejo. Dear Hetalji, Om Sairam. I tried twice to send prayers to the email id and in the way you have asked to but to my deep disappointment, I got a mail delivery failure notice from Yahoo. I do not know what I have done incorrectly but I am very much in need to send prayers to Shirdi. Kindly help! My name is Vidya and my email id is Meenakshi1926@yahoo.com. Sai baba Pls i need ur udhi for good sign, im planning to start my career, if i get ur udhi ill feel it as ur blessings for me. I fill up the form which was provided for udhi request, after filling it when i pressed submit, its not respoindg. i tried it from google chrome and ie. pls baba help me to get udhi prasad. BABA MYSELF SHISHER ROY FROM NASIK PLEASE HELP ME IN THIS DIFFICULT PERIOD GOING THROUGH. NOTHING IS HIDDEN INFRONT YOU, YOU KNOW EVERYTHING. Baba I waited twenty years. I dont think its going to work out. Today after falling asleep while listening to your Bhajans, I get a message like that. You make big miracles happen is this your way of punishing me for my last birth. Baba I dont know what I did in my last birth. But in this birth I have been loving, faithful and sacrificed and got nothing back. Dear Hetalji.thanks for the fabulous work u r doing..baba really bless ur family with all happiness..u dont know how much help ur doing..we all need baba blessings..today i requested for udi, prasad.sai photo...i dont know abt this website...i keep on searching abt sai in the internet then i found this amazing site..really i feel gud for this..please hetalji i need baba blessings..am in bad situation,,dont know wht to do..we r trying to have baby for past 2 yrs..dont know whts going on in my life..am not able to share anything to my family..the only one person i can share is sai..sai is really testing our patience..this is my personal problem..i waanna share with baba..our husband has zero count sperm..we were shocked..dont know wht to do..almost everyday am crying infront of baba..slowly am ready to face this big hurdle..we consutled a doctor..he suggested my husband for surgery..whether they can find out sperm or not because of any blockage this would happen but u guys have 60% chance he told..we r ready to face thise..if they find out sperm..they can retrieve an eggs from my ovaries..and finally they do the ivf..but somewhere we feel very bad all about thise..sometimes we would think that wht happened is like dream..we r not able to accept thise..why would thise happened for us..what we did..please ask sai for us..please hetalji.i beg u.please pray for us..please convey my problem to shiridi sai..i know sai is with me..why sai is testing me..please forgive all my mistakes sai..we never know all about thise..we r practically experince this worst situation in my life...baba please help me out from this hurdle..please be with us forever..we need ur blessings.but somewhere i know sai defenitely help me in thise long process..sai ur the one who can make impossible things make possible..aM DOING SAI VRAT from today..bless me with all success with healthy and cute baby..
OMSAIRAM...Hetalji am so happyyy..i live in usa..less than in a month got sai udi.am so surprised thank u so muchhh..got ur blessings sai..thank u sai amma..be with me forever sai amma.. I am getting some error everytime when I send a request for Udi. Please help. I really want to send some udi to my brother who lives in Germany. Kindly advise. Dear Hetal Ji - Thank you for your wonderful services of sending us the precious Udi of our Beloved Sai. I live in singapore. I have filled in the form and i got a confirmation mail too on 27th February. Till date i have not received the Udi. Can you please let me know what should i do next? I am sorry for bothering you. baba aap ka aashirwad hamesha mera saath rahe baba, baba aap apne baccho ke saath hamesha rahte hai!!! t receive it till today. Baba help me to come out of the situation. please send me sai baba udi. I am living in Ahmedabad. Please suggest from where I can get udi prasad from Sai Dham Sola, ANd whom should I contact? ?